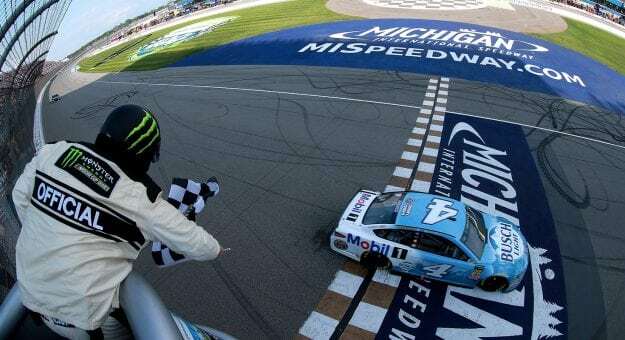 Pete Pistone distributes this week’s checkered and black flags following the weekend of racing at Michigan International Speedway and Mid-Ohio. The career season continued for Harvick with victory number seven of the year at Michigan and he did it in dominating fashion leading 108 laps and tying Bill Elliott on the Monster Energy NASCAR Cup Series all-time win list at number 17. He hadn’t posted a top-five since his season-opening Daytona 500 win until Sunday when Dillon’s fourth-place finish ended that drought. Even more impressive was Dillon was able to notch the finish despite a tire problem in the closing laps. It’s been a bit of a struggle in recent weeks for the Penske group but things were much better in Michigan. All three drivers finished in the top 10 led by Brad Keselowski’s second-place performance with Ryan Blaney fifth and Joey Logano 10th. Not even the most optimistic fans of Moffitt or Hattori Racing Enterprises could have predicted the season the No. 16 Camping World Truck Series team is having this season. Moffitt edged Johnny Sauter Saturday in Michigan for a thrilling win to put victory number four on the board. After spending what seemed like half the race off course Allgaier was able to run down and then pass Austin Cindric in the closing laps to win Saturday’s Xfinity Series race at Mid-Ohio Sports Car Course. It capped off another thrilling day of racing for NASCAR’s number two division at the twisting road circuit. This might be the only time in like two years the 78 team is on the receiving end of a black flag. But the decision to keep Truex Jr. out and run out of fuel at the end of Stage 1 was curious and led to a series of issues that added up to Truex Jr. being credited with a 14th-place finish. It looked like a day of at least some progress for Johnson and the Hendrick Motorsports No. 48 team. But a loose wheel in the closing laps put an end to those optimistic hopes and Johnson left Michigan with a disappointing 28th-place performance. Larson didn’t look like anything remotely close to a driver that has won three of the last four Michigan Cup races. He qualified 17th and finished in the same spot in a very mediocre and puzzling performance. Maybe not a black flag for Dillon, who was the unfortunate victim of the incident that sent him into the Turn 3 wall after running over what appeared to be a back-up battery on track, but for whatever driver’s car it came from. It’s hard to fathom something like that happening and certainly there should be some repercussion once NASCAR uncovers the culprit. The ridiculous territorialism of the racing world reached a new level when Kyle Larson announced he was imposing a gag order on himself to not talk about his sprint car racing affection “before I make everybody at NASCAR mad or some of my fans mad.” Rather than embracing all of motorsports and the community in return lifting the entire sport, for some reason many choose to split and fragment the racing world. It’s a short sighted and dangerous view that many fans, industry people and even media members need to stop immediately. The opinions expressed here are those of the writer and do not necessarily reflect the positions of the Motor Racing Network.